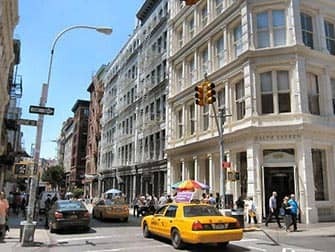 SoHo in New York: did you know that this cool name is nothing but an abbreviation for ‘South of Houston’? And that ‘Houston’ is pronounced as ‘house-ton’ as opposed to ‘hyoo-stuhn’? Houston is a street that runs East to West. And indeed, SoHo is located South of this street. At the end of the 19th century, a large textile industry developed in this area. This is reflected in the sturdy industrial buildings. 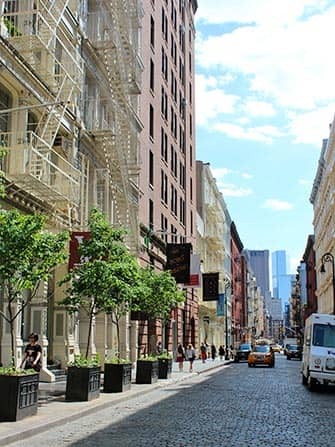 SoHo hasn’t always been a good neighbourhood, but from the 1960’s onwards, it became the place it is today: an artistic, creative area which is known for its boutiques, galleries and restaurants. In addition it is a popular location in films, so don’t be surprised if a street is blocked for a shoot. 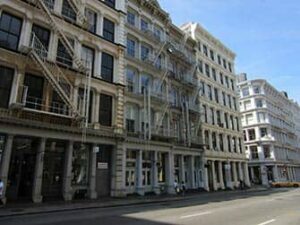 SoHo is one of New York’s safest neighbourhoods, a great place to visit when travelling alone. Seeing all the hipsters in the streets of SoHo, you’ll immediately feel like expanding your wardrobe! SoHo happens to be the perfect neighbourhood to do this. There are numerous places where you can take a break. For instance, you can visit the nicest bookstore in New York called McNally Jackson. 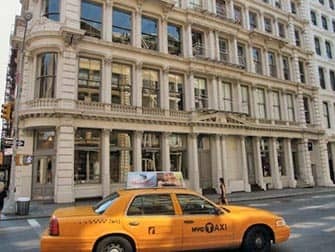 This place serves the best cappuccino and scones in New York. 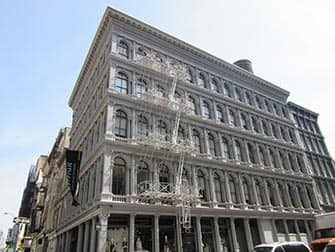 McNally Jackson is located on Prince Street, a great street to continue your shopping spree. If you would like to get to know SoHo better why not take a walking tour? You will also get to know the neighbouring districts Little Italy and Chinatown. The tour with a local guide will wander past the shopping and restaurants and teach you about the area’s rich history. Do you love hamburgers? 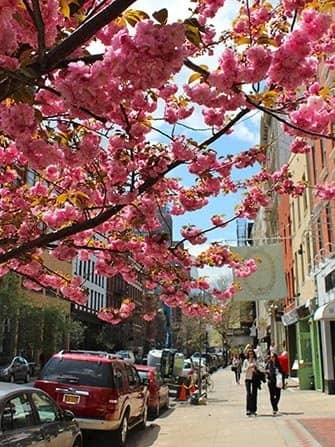 Then you already have one good reason to visit SoHo in New York! The Mercer Hotel serves one of the best hamburgers I’ve ever eaten in New York. I also very much appreciate their cocktails. Another fun place is Café Select at Lafayette Street: a nice café with a Swiss touch. It’s a great place to relax and order a sandwich for lunch or a meal for supper (I strongly suggest the hangar steak. Don’t forget to send me an email to tell me what you thought of it). Ben’s Pizza is one of the best pizzeria’s in New York and The Grey Dog serves excellent coffee and bagels. Planning on spending the evening in SoHo? 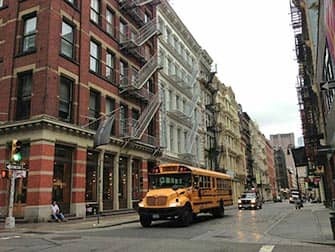 Unlike the Meatpacking District which is famous for its great nightclubs, SoHo is a little lower key with lots of fancy bars. They are not easy to find, you might have to wander about for while, but thats part of the fun. Start the evening with drinks and people watching at SoHo Grand. Then head over to Grand Street and take a left turn. Here you’ll find various spots to enjoy a beer. If the weather is good, I’d suggest going to The James which has an amazing garden on the second floor. Order a bottle of wine and enjoy the view of the Maserati garage in front of you. Don’t let the fact that there’s a bouncer standing at the door scare you, but do make sure to put on the new clothes you purchased during your shopping spree. It will be very much appreciated. You should also know that there’s an unwritten rule in New York that says women should wear heels when going out. There is one exception to this rule though: the East Village.